Developers are turning to landscape architecture firms, like SKS Studio, to help reimagine the senior living experience. A little over a year after a renowned senior living developer, Avamere, engaged SKS Studio to infuse words like “luxury” and “destination” into new developments. Our team is well into the design phase as we apply our luxury, hospitality-based landscape architecture and design expertise to two of Avamere’s projects. 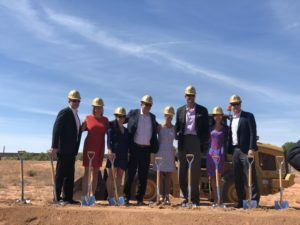 A groundbreaking ceremony was held recently in St. George, Utah for Ovation at Sienna Hills that is scheduled for a 2019 opening, and land has been cleared at Ovation at Heartwood Preserve in Omaha, Nebraska, which is anticipated to open in summer 2020. Both of these senior living developments will be located in new suburban areas built with urban elements so that residents have convenient access to multiple amenities. 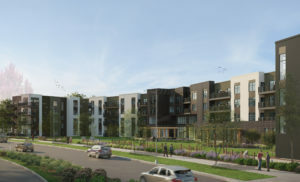 Seniors will be the first to move into their housing with other master planned development housing types nearby marketed towards residents of all ages, from millennials to young families and empty nesters. This multi-generational concept is intentional and attractive to seniors who are turning away from age-specific communities, preferring the mix of neighbors of all ages. In communities where ages are desegregated by design, residents of all ages benefit. There is no lack of research studies proving such. Studies have shown that seniors feel less isolated and have a stronger sense of purpose when living among other generations and are involved in their larger communities, while younger people are given the chance to absorb wisdom and life experience rather than dismiss seniors as feeble or out of touch. Ovation at Sienna Hills in Utah will offer assisted and independent living apartments, as well as independent living villas. Ovation at Heartwood Preserve in Nebraska will include assisted and independent living apartments. Both will offer memory care. Several studies have been published that point to the growing importance of functioning on a sensory versus an intellectual level as visual and mental ability shifts. For those with dementia, a well-designed landscape can help improve quality of life, bring enjoyment and encourage them to live a more active and stimulating life, which can help fight cognitive decline. Taking a cue from luxury resorts, these two senior living developments will feature amenities that promote social activity and wellness, including putting greens, yoga lawns, a pool and hot tub, fireplaces and fire pits, communal cooking stations, BBQ grills, community garden and pickleball courts. These amenities are set among swaths of native plantings and annual plants, which allow for the inclusion of vacation resort-style tropical foliage. Transferring our hospitality industry background into the context of reinventing the next-generation of senior living communities has been a natural and seamless transition for us. It certainly helps to work with a client, like Avamere, that understands the importance of landscape architecture and champions its effect on humans and the overall success of the project. Want to follow along as senior living projects like these move from the design to occupation phase? Click here to subscribe to our newsletter.